We’d love your help. Let us know what’s wrong with this preview of Daniel by Vicky Adin. This edition is no longer available. Please see 'The Disenchanted Soldier' for the latest version on this story. Libby was fascinated by the stories surrounding Daniel, by this man who looked down at her from the aged black and white photos on the walls some seventy years after his death. His story seemed inextricably linked to pioneering New Zealand and she wanted to know This edition is no longer available. Please see 'The Disenchanted Soldier' for the latest version on this story. Libby was fascinated by the stories surrounding Daniel, by this man who looked down at her from the aged black and white photos on the walls some seventy years after his death. His story seemed inextricably linked to pioneering New Zealand and she wanted to know more.To know what he was really like: his hopes, his dreams, his desires and his secrets. She was certain there were secrets. It’s 1863 when 21 year old Daniel, a trained soldier embarks on an adventure of a lifetime, in pursuit of a new life, of land, and to shrug off his past. Crossing the oceans to New Zealand to fight an unknown enemy, Daniel wins a medal for his efforts. Yet, he is soon disillusioned by war, by its violence and cruelty, its emptiness changes his life forever. Eventually, he finds happiness and heartache in equal measure with his great love, Emma, a young Prussian girl, building their life together in Foxton. To ask other readers questions about Daniel, please sign up. This book is an historical novel with the author basing it her own Adin family history.It is a good portrayal of the last six generations of Vicky's family,linked between England and New Zealand. The story is told by Daniel and Emma Adin (1842-1926)and Libby Adin a woman who married into the Adin family in modern times. Libby has often looked at the portrait of Daniel on the wall of the New Zealand family home ,wondering who he was and about his history.She talks to his remaining family. As an immi This book is an historical novel with the author basing it her own Adin family history.It is a good portrayal of the last six generations of Vicky's family,linked between England and New Zealand. As an immigrant from England I could readily find this book fascinating, as I too have felt the pull as Vicky did ,when going back to search for my own roots. The story melds seamlessly between then and now.It is a wonderful story of love,endurance,loss and triumph during the difficult time of settling and building New Zealand. The historical facts were spread throughout the story so well I think it would be a great way for people who know nothing about this country to read . Perhaps the younger generation could learn from it as well. The bibliography and time-line along with photos are very helpful to the reader too. An enjoyable read and I would recommend it to anyone. I won this book on goodreads. It is the true story of Daniel Adin written in story format which made it easy to read. 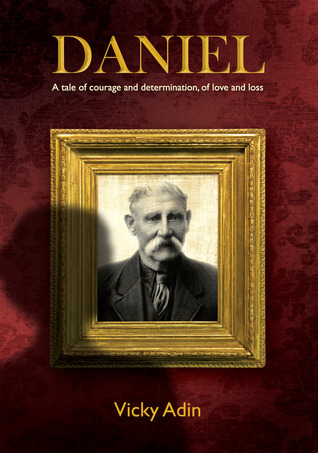 Daniel was born in England and in 1863 hops in a ship to come to New Zealand. What brave bunch of people to move to another country, where you knew no one and life was tough. As soon as Daniel hoped off the ship he was signed up to fight in the Maori wars. The white people decided to take the land off the Maori's. Daniel was ill at ease with the fighting, but did his job. After his I won this book on goodreads. It is the true story of Daniel Adin written in story format which made it easy to read. After his time in the army he moves to Foxton and live the rest of his life there. He started working in the flax factory, they used the flax to make rope and then moved on to working for the council in the ditch digging department. He was a likeable man and got on with all he met. At the age of 40 he met a very young woman and they spent the next 45 years together. They had 7 children and got on well. Life wasn't easy with floods and fire but they stood strong through the trials and joys of life. This book brought New Zealand history alive for me .Thank you Vicky for taking the time to write the book and make it available to read through Goodreads. It has been written in an interesting manner with the present day character recording the history of their earliest NZ ancestor , as well as aspects of the present family. I felt it worked well and records an excellent history of the family. I particularly liked the inclusion of significant NZ milestones such as the Maori Wars the volcanic erupt This book brought New Zealand history alive for me .Thank you Vicky for taking the time to write the book and make it available to read through Goodreads. I particularly liked the inclusion of significant NZ milestones such as the Maori Wars the volcanic eruption and women winning the right to vote. I was privileged to receive this book in a Goodreads giveaway. Thank you so much for the opportunity. It has been a real eye opener to me in New Zealand history, particularly in relation to the Maori wars, which the average NZer knows so little. In that regard it shocked me to learn of the unjust brutality against the Maori. Daniel's story is reflective of a lot of men (and women) who immigrated to NZ at that time. NZ was young and still finding itself as a nation and this story very much reflects I was privileged to receive this book in a Goodreads giveaway. Thank you so much for the opportunity. Daniel's story is reflective of a lot of men (and women) who immigrated to NZ at that time. NZ was young and still finding itself as a nation and this story very much reflects that. I received this book through a Goodreads giveaway, and couldn't wait to read it. I loved the story, the characters and the way it was written. This book is a 4 3/4 stars, so rounded up to 5. This book is also, a book of social comment on the period in which these people lived - with votes for women, the first world war and the harshness of live in rural New Zealand. A BIG thank you to the author, for offering this book and allowing us to read this family story. Add a bit of romance, friction and adventure and you have a brilliantly balanced historical novel. After decades of research Vicky has combined her skills to write poignant novels that weave family and history together in a way that makes the past come alive. She is particularly fascinated by the 19th Century pioneers who undertook hazardous journeys to find a better life. Especially the women, w Award winning historical fiction author, Vicky Adin is a genealogist in love with history and words. After decades of research Vicky has combined her skills to write poignant novels that weave family and history together in a way that makes the past come alive. She is particularly fascinated by the 19th Century pioneers who undertook hazardous journeys to find a better life. Especially the women, whose strength and determination to flourish in a new country still coming to terms with its existence is inspirational. Vicky draws her characters from real life stories - characters such as Brigid, the Irish lacemaker and Gwenna, the Welsh confectioner, or Megan who discovers much about herself when she traces her family tree back to Constance and Isabel in The Cornish Knot. Vicky Adin holds a MA(Hons) in English and Education. When not writing you will find her reading – she is an avid reader of historical novels, family sagas and contemporary women’s stories; travelling – especially caravanning, and cruising with her husband and biggest fan, and spending time with her family.